Yesterday was the first time I could actually wear a polish cotton long-sleeve shirt without breaking out in sweat. As much as I adore summer, it is time for some change. Have you noticed your skin becoming really dry? I have!!! I am switching to Cream de La Mer instead of lotion now. Instead of shopping for more clothing, I am thinking of buying accessories to update my wardrobe. 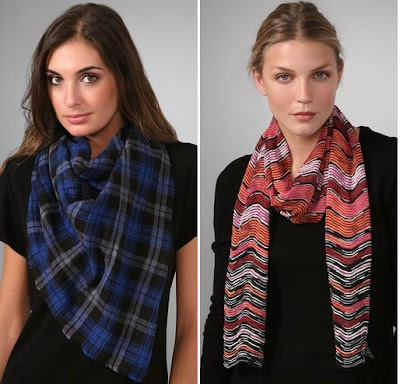 Personally I think scarves are the perfect fall/winter accessories to update a gal's wardrobe. Besides wrapping scarf around the neck, it can also become a belt, a halter top and a little shrug/jacket. This way, I can be stylish without spending too much. -right Emilio Pucci purple long scarf $485 --- I have been eye another Pucci scarf in the boutique but can't get myself to fork over my credit card yet. Last but not least, I totally adore these two lovely scarves from Ann Taylor. -left ruffle scarf $65 (black and pink also available) --- If I arrange the ruffle scarf correctly I may be able to get a similar ruffle effect as the RL scarf above. 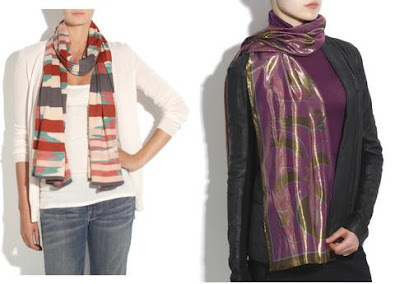 -right ruffle silk cashmere scarf $45 (both image via Ann Taylor) --- I can buy a few without hurting the wallet at all. Speaking of scarf, thanks to the lovely folks over at Chickdowntown, one lucky Savvy Mode reader will be win this Tolani scarf (retail value $85) to kick off fall wardrobe. I picked this piece because it reminded me of Missoni prints. Don't forget to join Chickdowntown on Twitter to get the latest updates on giveaways and fashion tidbits. -Must be a Savvy Mode subscriber and leave me a comment on how you will wear this scarf. Entry is open to all Savvy Mode readers, domestic and international. I would wear it as a shrug over my little black dress. Ralph Lauren silk ruffle scarf so cute!!! I adore scarf, but no body in my city wear scarf because the weather so hot. if we wearing a scarf, we looks like getting cold. I love your Missoni scarf! And that Ralph Lauren one is divine. I think your question should be how wouldn't you wear the Tolani scarf! I bet it'd be darling with everything. I LOVE scarves! It's so funny because my outfit for work tomorrow is a white top with a scarf (from H&M). It's the perfect way to add to an outfit. I love the one in the giveaway, very colorful. You could wear it in so many ways, it'd be fun to experiment with all the possibilities. I think scarves are a great accessory and can really change the look of any outfit. You chose some very nice ones- beautiful colours and patterns. Fabulous giveaway. I love scarves and I'm always trying to incorporate them with simple dresses or shirts, just to liven things up. A scarf like this would be lovely with a plain dress. I definitely agree that scarves can make a great accessory!! I love scarves! I would probably wear this with a white tank top or shirt and a cardigan or jacket/blazer over it. I love scarves, though have so many I'm not entering the giveaway. Your blog was in my dream last night, it was surreal! 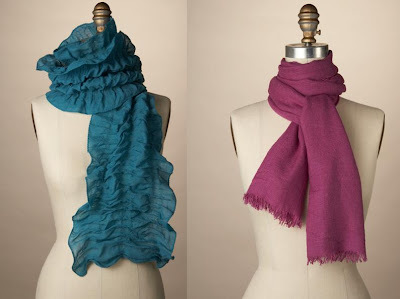 I love that Ann Taylor ruffle scarf - the teal blue color is so perfect for fall/winter/spring. How would I wear the giveaway scraf - as a belt with jeans and my hot pink blazer for casual Friday work wear. Also, I pick up a vintage NM wool maxi coat during the summer at the yard sale - so the scarf will also be a fab substitute for my pashmina. Also, thanks so much for highlighting the Chanel white shirt. One of my gf's has been on the hunt for the perfect white shirt. I had suggest Anne Fontaine, but I think she's looking for something without all Anne's usual rosettes. Hi there-great minds think alike, I've scheduled some scarf posts for this week too!! You look lovely in your Missoni scarf and jeans and white shirt, and I agree, I'll be using a lot of my scarves to update my winter wardrobe-great post!! i agree. scarves make a diff. i love scarves! I really like the look of scarves, but for some reason, I always forget to wear them, or I feel weird keeping them on all the time, as a basic fashion accessory. I have worn the scarf I won in your giveaway, and I love it. I just need to wear it more often! Fab giveaway...very Missoni. I am a follower and going to tweet this now! I would wear w/ skinny jeans, my Uggs, a white shirt, Marc by MJ trench I have- it would bring the look together! I would wear the scarf with a solid print top, a skinny jean, boots, and a leather jacket. You look fabulous SG! I love the touch of colour. I'm a big fan of basics too and love to use scarves and accessories to give that pop of colour. This scarf is lovely (probably don't qualify as a Cdn res) of course it would always go with jeans but I would actually pair it with a cropped black leather jacket, a long skirt or my black or eggplant maxi and boots (black or camel). I would like one of each but especially the ruffled one! I am so glad that summer seems to be backing off. Can't wait to start wearing fall clothes and scarfs again!!!! love your outfit and really love your hair curly like that!!! i love your hair, SG! You are so right, dear. It def changes the look with a scarf. I love the taupe ruffle scarf! I have sooo many scarves and rarely grab them. I don't know what's wrong with me. Ooh I'd wear the Tolani scarf with a black blazer, black tee, dark wash skinny jeans, and electric blue suede flats with silver studs on them. Love love love that Tolani scarf! When we gave it away, that is exactly why I chose it too. Ahhhhhh, Missoni. I would rock it with jeans and a plain white tee until the weather cools down. Love all the scarves you featured and I love your multi-colored scarf as well. That's one downside of having a fall vacation for me... in the tropics, I never have to worry about dry skin. Now, I need an extra dose of moisturizer. I'm using Creme dela Mer as well. And to think, I'm just shuttling back and forth between LA and San Francisco only. my mum love scarfs and accessories in general for their power to transform an outfit. You look super pretty as usual in that lovely image of you. that ruffled white scarf is gorge! Love these, especially the plaid one! i love scarves! and its finally getting cool enough that i can actually utilize mine!! this post makes me want to go buy a few more!! I agree, scarves truly are the perfect accessory. They are my favorite in the fall and winter. 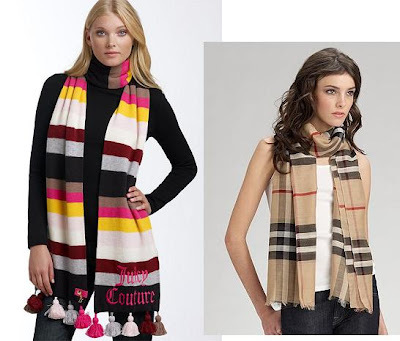 I love everything from a classic cashmere Burberry scarf with a coat to a frilly scarf with a sweater. Please count me in for this giveaway. If I won it, I would wear with dark denim jeans, brown boots and blue 3/4 length sweater. 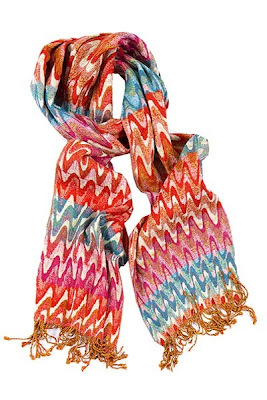 This print really does remind me of Missoni and I think Tolani scarves are great.. I have also posted this on the sidebar of my blog! Count me in for 3, please. Have you checked out anthropologie's website? you might like this one. ooooh, i love me some Tolani scarves -- and share your appreciation for this particular print! great choice! i'd sport this one with my usual fall "work uniform" of a fitted tee and some nice trousers (sometimes with a cardi & sometimes with a jacket) and tall boots. again, thanks for a fabulous giveaway! Can I wear it as a turban & Jackie O glasses...a convertible vintage Jaguar would be nice as well! I love scarves! And the one you're wearing just adds so much to the outfit! Love it! I tend not to wear scarves. Reminds me of high school too much. I went to this crazy school in New Jersey that was done campus-style, with multiple buildings, except the buildings were teeny-tiny and uninsulated. We wore our jackets and scarves inside and out all winter. I remember one history class where the teacher had to change his lesson plan for the day because everyone was wearing mittens and couldn't take notes. I would wear that scarf with a fall wrap/cape. Yes! Dry skin galore! Creme de la Mer sounds divine! I love the scarf on you and the ones you chose! They are all so beautiful and it seems like a wonderfully French thing to add a scarf to your outfit to change it up just a little. I need to an invest in a Hermes one of these days! Love your site! I am now a follower! I would wear this scarf on a chilly day to class with a pair of dark jeans, chic boots, and a white tee/sweater so that the scarf really pops! Ugh, I wish it was cool enough to wear scarves! Unfortunately, it's always summer in Hong Kong. Love the giveaway, though! Of course I'm a subscriber. I'd probably wear it with one of my LBDs for now (only way to escape the oppressive heat) then with a floral button-down once it got cool enough (love mixing patterns). Yay! Of course I am ogling the giveaway scarf! I love the bright colors. I immediately thought of wearing it with red, rose pink, or aubergine that would make the colors sing. It would look awesome with mustard, too. Thanks for offering an awesome giveaway to us again! I really like scarfs: they keep you warm in winter and they look so stylish :). I've had to find my hats already it's almost freezing here. Literally. Love this outfit. It's very clean and simple, which I like. The scarf is great, and I agree that it's definitely a great accessory piece for fall. And great tip for updating your fall wardrobe without spending too much money! I love scarves!! I would wear it with Skinny jeans and a simple top. I would wear the Tolani scarf over a black casual LBD and a blue denim jacket! I would use it as a head scarf with some great gold gypsy earrings, black tee and satin green cargo cinch capris with copper heels. My Fall wardrobe consists of too much darkness so this scarf would really brighten things up, especially since my mood seems blah in colder weather. I would wear it with a white top and dark jeans. I am a huge scarf fan. I agree that they are one of the easiest ways to change a look up. And this one would be great w/ the black cord jacket I have and a white button up. Just the right amount of pop! I would wear the scarf with a carmel or tan suit. I love wearing scarves with suits. I hope I win but good luck to all! Okay, so there is no awesome haute couture coming from my wardrobe but I’d wear this Tolani scarf with my Banana Republic smocked purple vneck top. I think that would make the colors of the scarf really pop. Next, I’d wear it with my gray skinnies from Garage and my vintage tan boots. With accessories, I’d go with something simple because I don’t want to take any attention away from the scarf so a small pair of pearl earrings. I’d go for something bronze-ish and shimmery for my day makeup to keep a fresh face and dramatize it with some dark brown liner, mascara and dark coral lipcolor for night. Woohoo! I’ve wanted a Tolani scarf for a long time now. They’re really different than the ones I see in stores in my city. It’s gotta be the handmade elements. So beautiful and ethnic! Last piece that would go great with this is my boho brown bag from Aldo.